Preliminary third-quarter data revealed an upturn for the Sub-Saharan African (SSA) economy on the back of the region’s heavyweights, after having faltered in the second quarter. Regional growth in the third quarter picked up to 2.9% year-on-year (Q2: +2.3% year-on-year), broadly in line with early estimates (previously reported: +3.0% year-on-year). Despite what is expected to have been another recession-mired quarter for Angola, both Nigeria and South Africa—by far the region’s largest two economies—notched broad-based gains. In Nigeria, both the oil and non-oil economies improved thanks to fewer pipeline disruptions and stronger agricultural- and services-sector output, respectively. Meanwhile, South Africa’s short-lived recession was brought to an end as greater agricultural yields, as well as firmed-up industrial output, helped lift the economy out of the doldrums. Among the other economies for which third-quarter national accounts are available, Rwanda and Senegal witnessed faster growth in the quarter. Mozambique, on the other hand, posted broadly stable—albeit subdued—growth from a quarter earlier on buoyant external demand for extractives. Regional politics has been all over the map lately. On 7 December, the IMF approved a sizeable loan for recession-hit Angola—a lifeline that analysts argue could help restore the economy’s fiscal and external buffers. Meanwhile, political instability has been mounting as Nigeria and South Africa gear up for elections. In Nigeria, a bruising presidential campaign has been ratcheting up ahead of the 16 February vote; in South Africa, Cyril Ramaphosa has been laying the groundwork for his re-election bid, vowing to push ahead with sorely-needed economic reforms as his country wrangles with tepid growth prospects. On 23 December, the Democratic Republic of Congo (DRC) will elect Joseph Kabila’s would-be successor—an event that, analysts fear, could spark civil strife. In line with a third-quarter pick-up, the regional recovery—and, notably, the region’s heavyweights—should gather some momentum next year. A buoyant global economy and, in turn, firm commodity prices are expected to fuel the acceleration in export-driven economies, while upbeat public- and private-led investment should propel growth in many of the region’s smaller economies. More broadly, however, the economic backdrop has grown challenging. Political uncertainty will drive the regional narrative early next year as Nigeria and South Africa head to the polls. Meanwhile, commodity-driven economies could run up against a pullback in global trade. Emerging-market capital flight will remain a major downside risk, especially for those economies running current-account deficits. In line with our continuous efforts to improve coverage of the region, we introduced the Consensus Forecast for Cameroon in our December 2018 publication. This month, we are launching the Consensus Forecast for Rwanda, Senegal and Zimbabwe. Accordingly, they have been included in our aggregated regional forecasts and the region’s historical data has been updated accordingly. Full-year regional growth was slashed to 2.8% this month, held back by recession-hit Angola. Next year, regional growth is seen picking up to 3.6%, which is down 0.1 percentage points from last month’s revised forecast (3.7%; previously reported: 3.6%). Last month’s forecast was revised up a notch on the inclusion of Rwanda, Senegal and Zimbabwe into the aggregated regional forecast. For 2020, growth is set to scale to 3.8%. This month, ten of the region’s economies had their 2019 growth forecasts slashed; including major players Angola, Nigeria and South Africa. In contrast, the DRC, Ethiopia and Mozambique had their forecasts raised. Ethiopia and Cote d’Ivoire are expected to lead the pack next year, with both seen growing at over 7.0%. In contrast, South Africa and Angola are seen trailing significantly as the only economies growing below 2.0%. Economic growth accelerated in the third quarter, buoyed by improved dynamics in both the oil and non-oil economy. Oil output edged up after slumping in Q2 as pipeline disruptions eased, although the energy sector remained weak and contracted again in Q3. Meanwhile, growth within the agricultural and services sectors propelled the non-oil economy’s expansion. Data for the fourth quarter paints a mixed picture: While the PMI rose in November, oil prices fell sharply in the same month. Moreover, oil production will be hampered in the coming months after Nigeria agreed to reduce production starting in January as part of the OPEC and non-OPEC oil output cuts announced on 7 December. Nevertheless, the cut should have a relatively modest impact given that Nigeria had been producing below its previous quota due to capacity constraints. Growth is seen accelerating moderately next year. Lower inflation and a likely minimum wage hike should lend support to private consumption, while government spending should also pick up. Restrained oil production will drag on growth, however, and political uncertainty ahead of February’s elections is casting a cloud on the country’s economic policies. FocusEconomics panelists see GDP increasing 2.5% in 2019, down 0.1 percentage points from last month’s estimate, and 2.9% in 2020. An inventory-driven recovery in the third quarter topped analysts’ estimates and ended the technical recession that blighted the economy through the first half of the year. In annualized terms, household spending staged a comeback following a value-added tax hike in the second quarter and appears to have also received a one-off boost from government employees’ back pay. Fixed investment, on the other hand, contracted sharply as firms’ plans were put off by the controversial land-reform debate. Despite a jump in exports, bolstered in part by greater automotive-related volumes, the external sector dragged on headline growth. Meanwhile, a supply-side breakdown revealed an industry- and agriculture-driven rebound in the quarter. Looking ahead to the remainder of the year, improved private-sector metrics through November could hint at a sorely-needed upturn in fixed investment. On the other hand, fiscal woes—compounded by weak growth prospects and rising debt-servicing costs—pushed two of the three credit-rating agencies to keep their junk-status views in recent weeks. Tepid year-end growth prospects aside, FocusEconomics analysts expect the economy to bounce back somewhat next year. Higher real wages and last-ditch fiscal stimulus are likely to lift economic sentiment ahead of next year’s elections and should serve to stoke household spending and fixed investment, respectively. Additional credit-rating downgrades will remain a key downside risk amid tense economic and political anxieties, however. Concerns over fiscal slippage and the inadequate pace of structural reforms are weighing on medium-term growth prospects. FocusEconomics analysts expect growth of 1.6% in 2019, down 0.1 percentage points from last month’s forecast, and 1.9% in 2020. On 7 December, the IMF approved a USD 3.7 billion credit facility for Angola to support structural reforms pursued by President João Lourenço’s government and help the country restore external and fiscal sustainability. The approval allows for an immediate disbursement of around USD 990 million, with the rest of the funds scheduled to be phased in over a period of three years. The Fund’s decision came against the backdrop of an ongoing recession. Economic sentiment deteriorated again in Q3 and slid to a one-year low as ongoing economic reforms had little impact on boosting confidence in the country’s all-important commercial, manufacturing and construction sectors, all of which remained deeply entrenched in negative territory. Available fourth-quarter data paints a mixed mixture: Angola’s oil production fell again in October from the previous month, although it rebounded in November. Nevertheless, plummeting global oil prices suggest the economy will again finish this year stuck in deep recession. The economy is expected to return to expansion in 2019, bolstered by improving domestic demand and a rebound in oil production. Waning inflationary pressures should prop up private consumption while ongoing economic reforms, reinforced by support from the IMF, should bolster fixed investment. Angola’s chronic dependence on the volatile oil sector remains the key downside risk to the outlook, however. FocusEconomics panelists see GDP expanding 1.9% in 2019, which is down 0.4 percentage points from last month’s forecast, and 2.3% in 2020. The economy likely sustained a solid pace of growth in the final quarter: Private sector activity seems to have expanded robustly in October and November, despite losing some momentum from H1, while the arrival of the short rainy season likely boosted agricultural and hydro-powered electricity output. That said, a slowdown in remittance inflows, rising inflationary pressures—mainly owing to the adoption of the 8% VAT on fuel—and continued lackluster credit growth, which bode ill for household incomes, point to weaker private spending in the quarter. Moreover, although the introduction of the VAT has improved the fiscal account, the misalignment between overly optimistic revenue targets and the government’s spending plans raises concerns about its ability to satisfy its fiscal consolidation goals. In view of making debt repayments more manageable, the country is looking to roll over a syndicated loan worth USD 760 million and extend the maturity of the debt. Growth momentum will likely be sustained in 2019, as healthy remittance inflows and a tighter labor market drive solid private consumption, while upbeat business confidence fuels a strong expansion in fixed investment. However, the prevalence of the interest rate cap will likely continue to limit the availability of credit and could hinder the government’s ability to secure additional funding from the IMF. This, coupled with fiscal tightening measures, pose headwinds to the outlook. FocusEconomics analysts project GDP growth of 5.8% in 2019, which is unchanged from last month’s forecast, and 5.7% in 2020. FocusEconomics’ comprehensive estimate revealed that inflation was broadly stable at the beginning of the fourth quarter. Regional inflation clocked in at 8.2% in October amid rising fuel costs, steady from September’s revised reading (8.2%; previously reported: 8.6%) on the inclusion of Rwanda, Senegal and Zimbabwe into the aggregated regional forecast. Inflation in Nigeria was stable from a month earlier, while it crept up in Kenya and South Africa and fell in Angola. Notably, inflation in the DRC has been sitting comfortably in single-digit territory after spiking last year. More broadly, bumper agricultural yields across the region have been keeping food prices in check. A preliminary estimate suggests that inflation was stable at 8.2% again in November. Next year, FocusEconomics expects regional inflation to moderate and average 8.6%, which is unchanged from last month’s revised forecast (8.6%; previously reported: 8.8%). Last month’s forecast was revised due to the inclusion of Rwanda, Senegal and Zimbabwe into the aggregated regional forecast. Inflation is seen easing to 8.1% in 2020. Looking for forecasts related to in Sub-Saharan Africa? Download a sample report now. 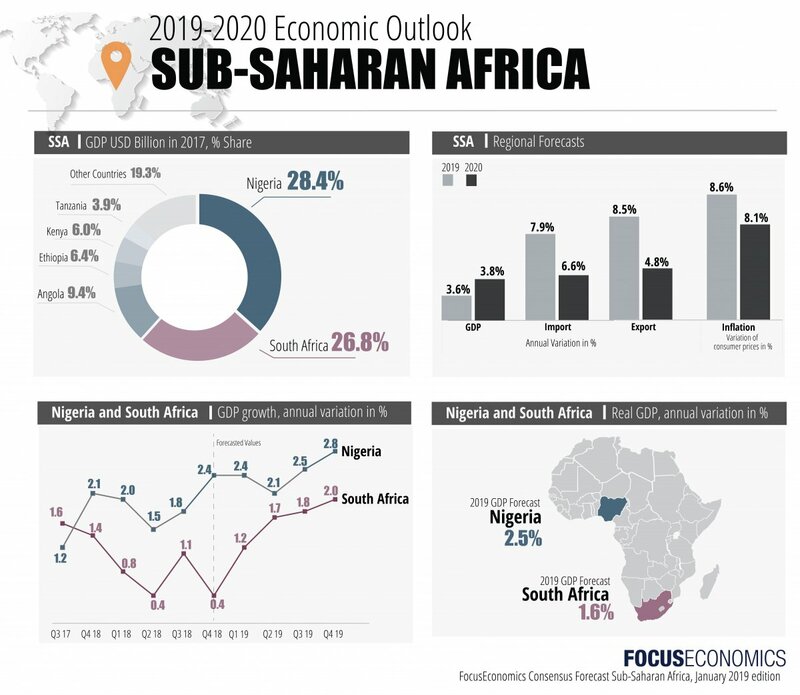 Regional growth is seen picking up for a third year in a row in 2019, as Nigeria’s recovery gathers pace and Angola exits from a three-year recession. Q3 2018 upturn strengthens on continued broad-based gains Comprehensive third-quarter data revealed a strengthening recovery of the Sub-Saharan African (SSA) economy as the region’s heavyweights shook off a midyear malaise. Heavyweights under pressure in Q2 Comprehensive second-quarter data revealed an unexpectedly downbeat outturn for the Sub-Saharan African (SSA) economy, which faltered mid-year as the region’s heavyweights staggered. Regional recovery continues in Q2 A preliminary estimate of regional GDP revealed that Sub-Saharan Africa’s (SSA) recovery kept pace in the second quarter, as the economy revives after the slump triggered by low commodity prices.